NASHVILLE, Tenn. (December 10, 2015) – With Christmas just around the corner, Country Music Hall of Fame and Statler Brothers member Jimmy Fortune, isn’t slowing down promotion for his latest album/DVD, Hits & Hymns, with several upcoming appearances planned. Released in September, the project went on to become the singer’s first solo top ten record on the Billboard Country Albums chart, while also topping the Billboard Music Video (DVD) chart as well. Don’t’ miss Fortune on an upcoming episode of RFD-TV’s “Ray Stevens’ Nashville,” set to air on December 26 (check local listings here). Grammy award winner, Ray Stevens brings some of the top guests on the show for an exciting program which is filled with laughter and some of the top musicians in the business. Be sure to tune in as Fortune delivers an unforgettable performance, while also catching up with his old friend in the process. SIRIUS/XM enLighten is planning to premiere Jimmy’s album feature. I am excited to be a part of the 2016 Dailey & Vincent LandFest presented by Springer Mountain Farms in Denton, NC this September along with my friends Official Dailey & Vincent and some of the greatest acts in country, bluegrass and inspirational music. It’s a three day festival that promises great music, comedy, and family fun. NASHVILLE, Tenn. (November 2, 2015) – After joining the legendary Statler Brothers in 1982, winning countless awards, and being inducted into both the Country Music Hall of Fame and Gospel Music Hall of Fame, Jimmy Fortune is no stranger to success, as he continues to reach new heights. His latest album Hits & Hymns, is off to a roaring start, as it debuts on Billboard’s Country Albums chart at No. 10, becoming his first top ten record on the chart as a solo artist. The feel-good album also debuts at #1 on the Southern Gospel Album chart and No. 6 on the Billboard Contemporary Christian Album chart. Hits & Hymns is available at Cracker Barrel Old Country Store® locations, iTunes, Amazon, and music retailers nationwide. Accompanying the album is the Bill Gaither hosted DVD special, Jimmy Fortune: Hits & Hymns, which also debuts with strong numbers. The collection debuts at No. 1 on the Billboard Music Video chart, along with No. 1 on the Christian Music Video chart, marking Fortune’s first #1 solo project. Fortune traveled to Indiana to tape the hit DVD, with a featured appearance by Bill Gaither. In addition to performing every song on the album, the “Elizabeth” singer opens up about some of his biggest trials and triumphs. Fans got to preview the collection ahead of time, as it made its debut last month on TBN, Heartland, The Miracle Channel, DISH TV, and more. NASHVILLE, Tenn. (October 23, 2015) – Country Music Hall of Famer and Statler Brothers member, Jimmy Fortune, continues his successful career as a solo artist with the release of his latest project, Hits & Hymns, available for purchase now in Cracker Barrel Old Country Store® locations as well as music retailers nationwide. Hits & Hymns is also available online at iTunes, Amazon. Fans looking to make this special a part of their DVD collection can purchase it at ChristianBook.com, SpringSide.com and FamilyChristian.com, or pick up the CD + DVD combo at JimmyFortune.com. Fortune will give a career-spanning, in-depth interview Monday, October 26, on a special edition of Heartland TV’s Reflections. The show, hosted by Keith Bilbrey, takes viewers inside the life and career of some of country music’s most influential artists of all time. Fortune sits down with the Tennessee Radio Hall of Fame DJ for a discussion about his career with the Statler Brothers, life struggles and triumphs, along with what lies ahead for the chart-topping singer/songwriter. In addition to Reflections airing on Heartland TV, the show will air on Blue Highways TV, The Family Channel, Angel Two (DISH TV) and AMG-TV (check local listings). Fortune is also featured in the latest issue of Homecoming Magazine and an upcoming November issue of NASH Country Weekly. And if that’s not enough Jimmy Fortune for you, there are features on Billboard.com, and in upcoming issues of Country Music People, the Country Standard Time and many more. Jimmy also recently sat down with SiriusXM’s Deborah Allen for a preview of the album on Prime Country. Part of Jimmy’s new DVD will air starting today. Please look at the list below to view in your area. The times listed are Eastern!! 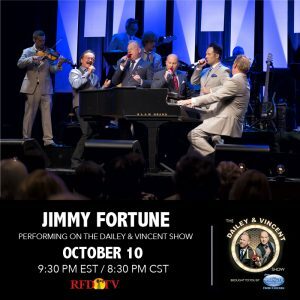 Tune in to RFD-TV this Saturday night (10-10-15) at 9:30PM/EST / 8:30PM/CST for another episode of the Dailey & Vincent Show featuring guest artist Jimmy Fortune! !